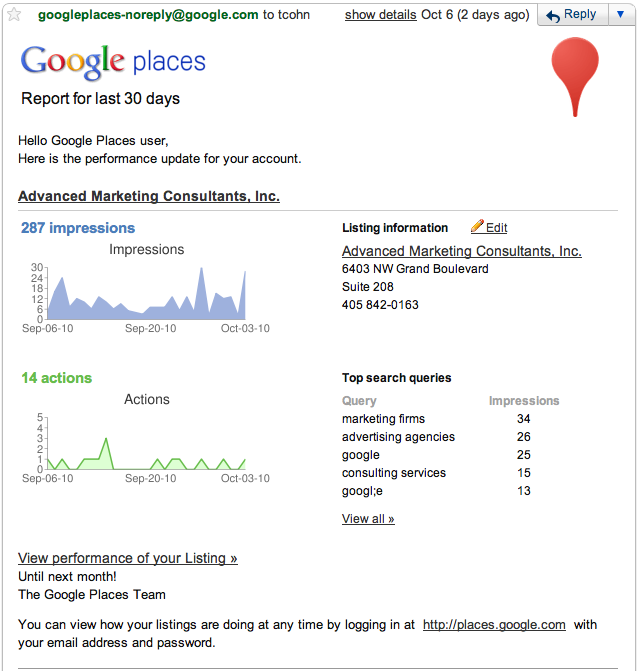 Getting Google Places traffic reports may not be unusual for businesses that have claimed their Google Places account. 1. I have never claimed my Google Places account for my business. 2. As a rule – Google doesn’t show Map results of Advertising or Marketing businesses at the search results level in Google.com. The only traffic an advertising or marketing firm can generate for its Places account is from searches done at the Map level. Search traffic generated by maps as a percentage of all search traffic generated for the small business is low single digits at best and thus virtually insignificant. I am sure for most small businesses getting Google Places search traffic reports is even more so. This entry was posted on October 10, 2010 at 7:36 pm and is filed under Google Places. You can follow any responses to this entry through the RSS 2.0 feed. You can leave a response, or trackback from your own site.